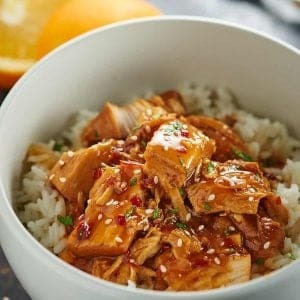 Easy Thanksgiving Recipes! Everything from snacks, apps, sides, and desserts! How is it already November 1st?! I don’t know about you, but the moment November 1st hits, my mind immediately goes to Thanksgiving planning. So today, I’ve rounded up all my favorite Thanksgiving Recipes: snacks, apps, sides, desserts, everything! Healthier Spinach Artichoke Stuffed Mushrooms, the perfect appetizer for easy entertaining! 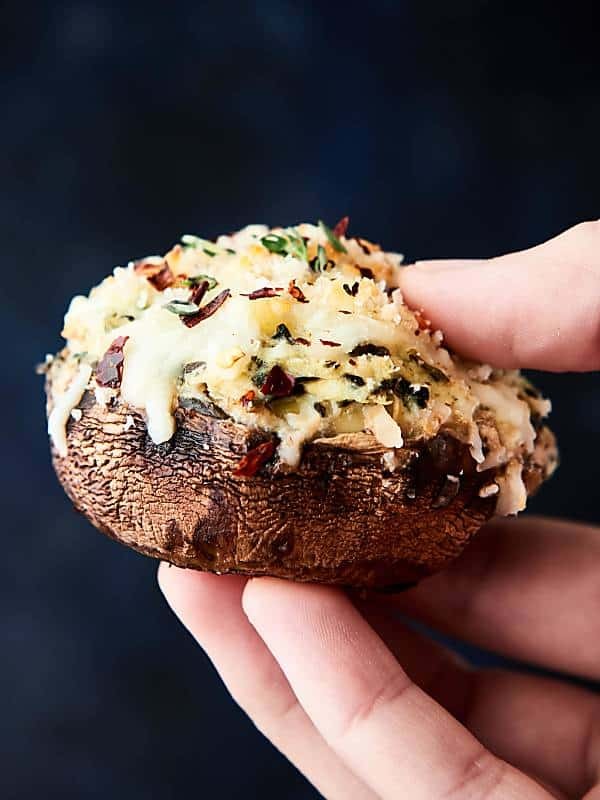 Mushroom caps stuffed with a greek yogurt spinach artichoke dip, topped with mozzarella, and baked to gooey perfection! 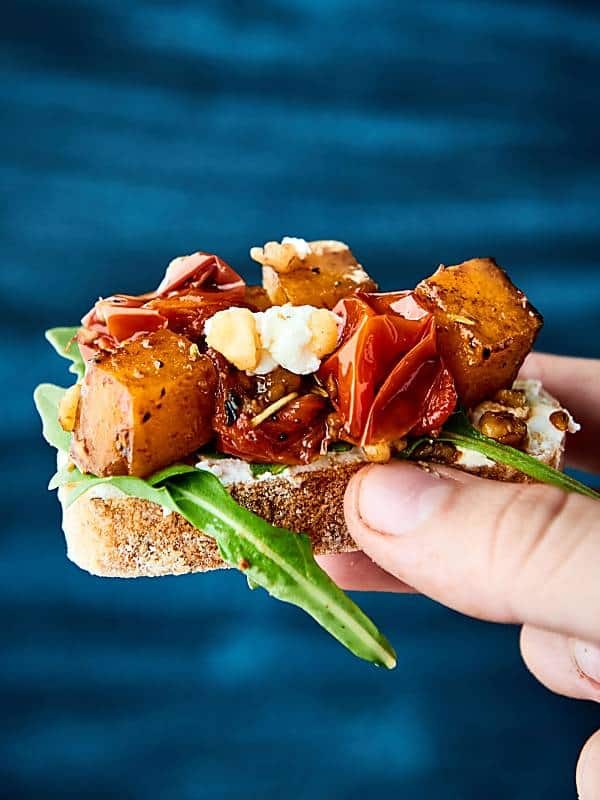 Roasted Butternut Squash Bruschetta. Chewy baguette topped with goat cheese, arugula, roasted butternut squash and tomatoes! 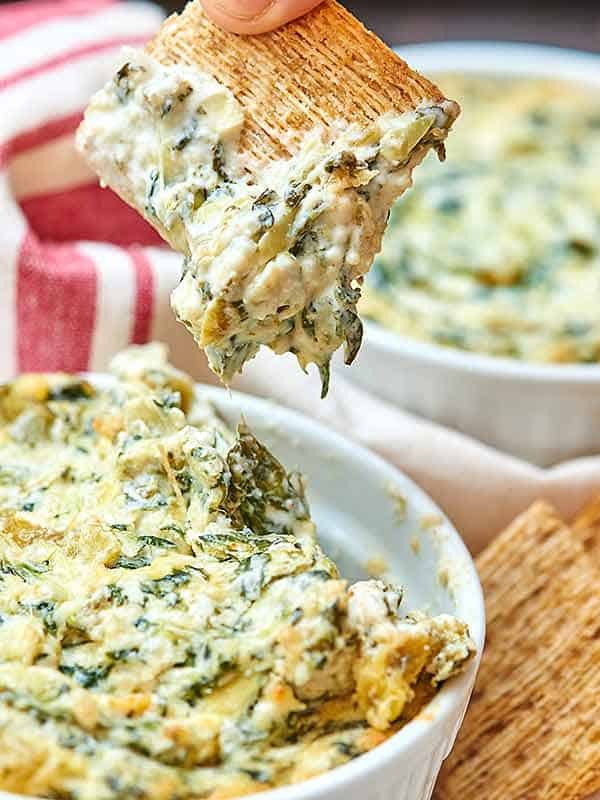 Spicy Spinach Artichoke Dip. 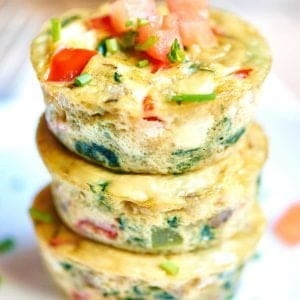 I really love how different this is from other spinach and artichoke dips, because of the green chilies and jalapeños…it really takes things up a notch! 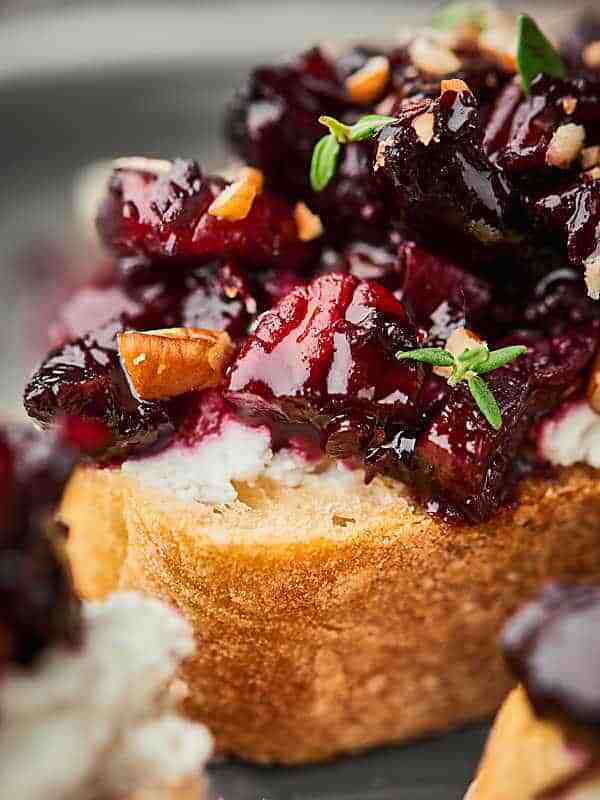 A twist on a classic, this Cherry Bruschetta is the perfect holiday appetizer. Full of sweet dark cherries, pecans, rosemary, thyme, and pinot noir, it comes together in minutes and is paired with a chewy baguette and tangy goat cheese! These Bacon Wrapped Dates are perfect for Thanksgiving (or any!) snacking! 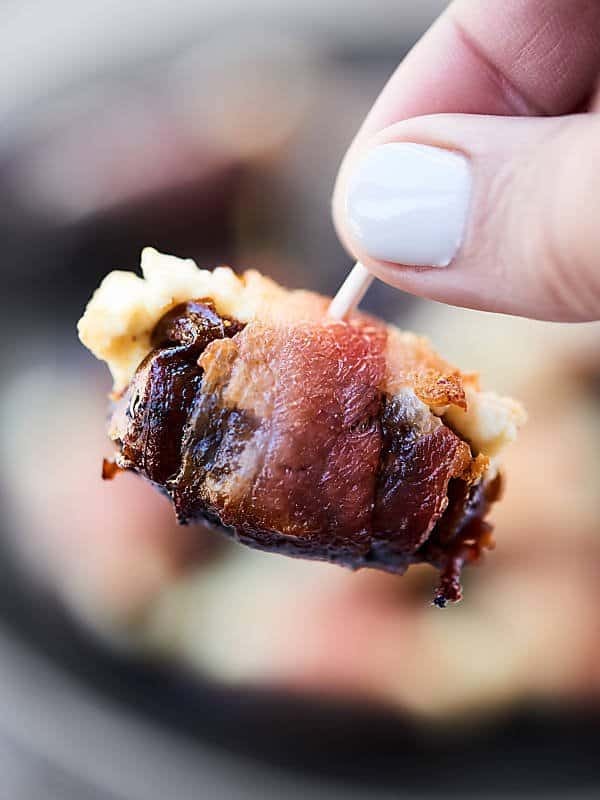 Only 3 ingredients – bacon, dates, goat cheese – and 20 minutes needed for the easiest and tastiest snack! 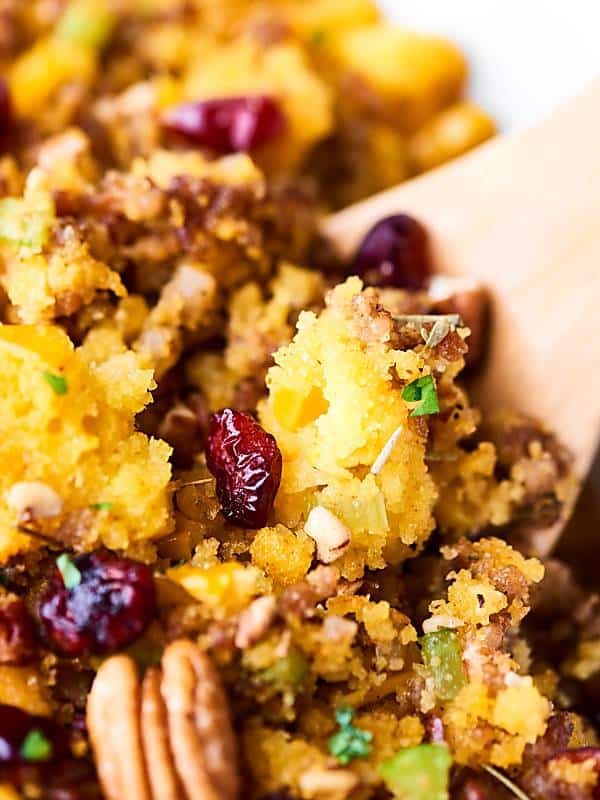 An easy gluten free stuffing, this Cornbread Dressing Recipe will surely impress! Full of italian sausage, vegetables, homemade cornbread, cranberries, spices, and more! 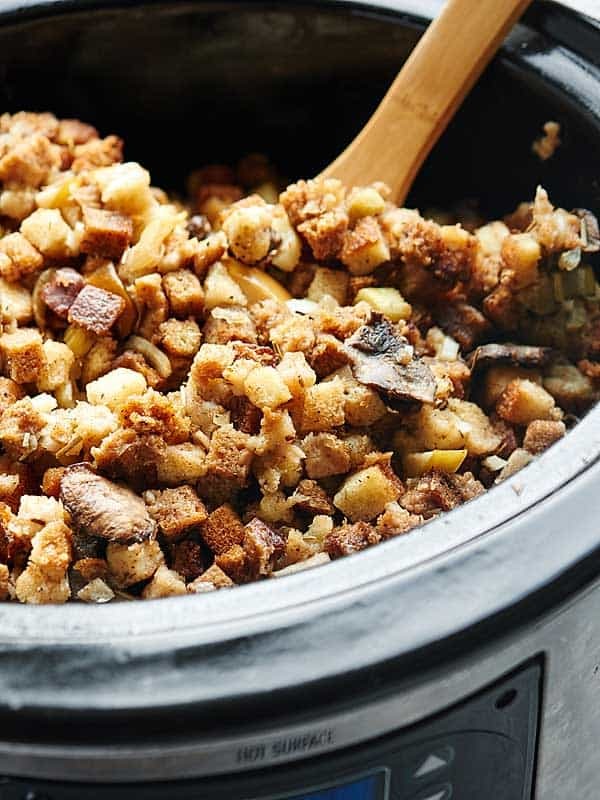 This Easy Crockpot Vegetarian Stuffing Recipe (can be vegan!) only takes 15 minutes of prep! The perfect Thanksgiving side dish! 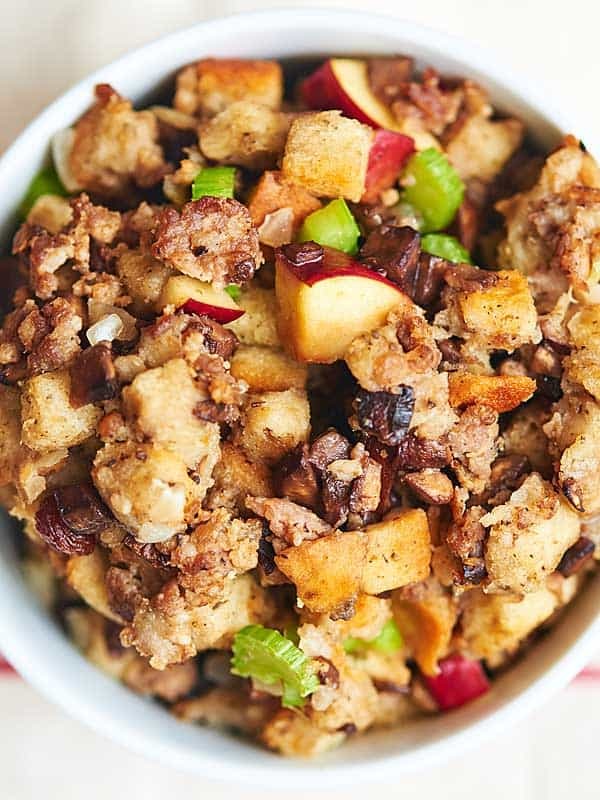 This best ever sausage stuffing is salty from the sausage, crunchy from the bread cubes, sweet and tart from the red delicious apples! 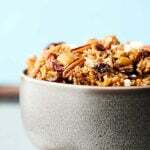 Move over turkey, this best ever stuffing is ready to take the main stage! 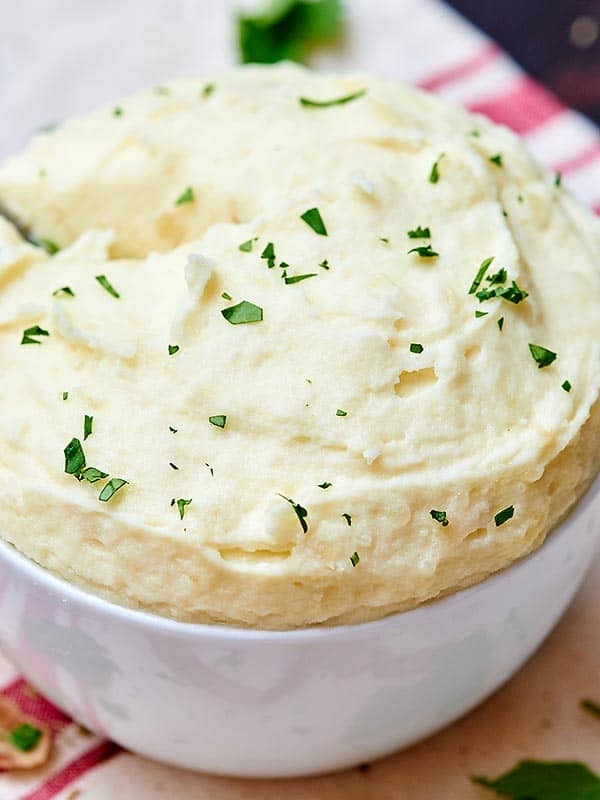 This crockpot mashed potatoes recipe is SO easy & full of rosemary, thyme, cream cheese, parmesan, & sour cream! A great addition to your Thanksgiving meal. 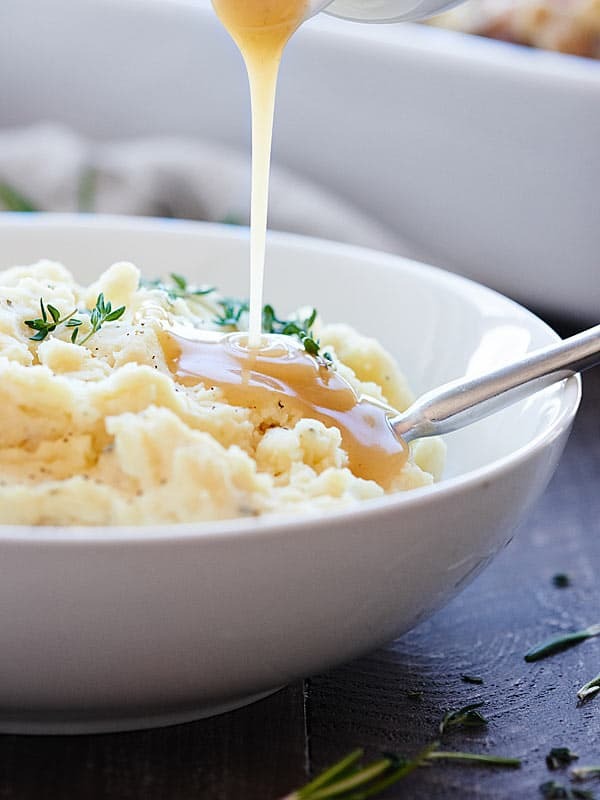 These ultra creamy potatoes are chunk free and are the perfect side dish to any occasion! 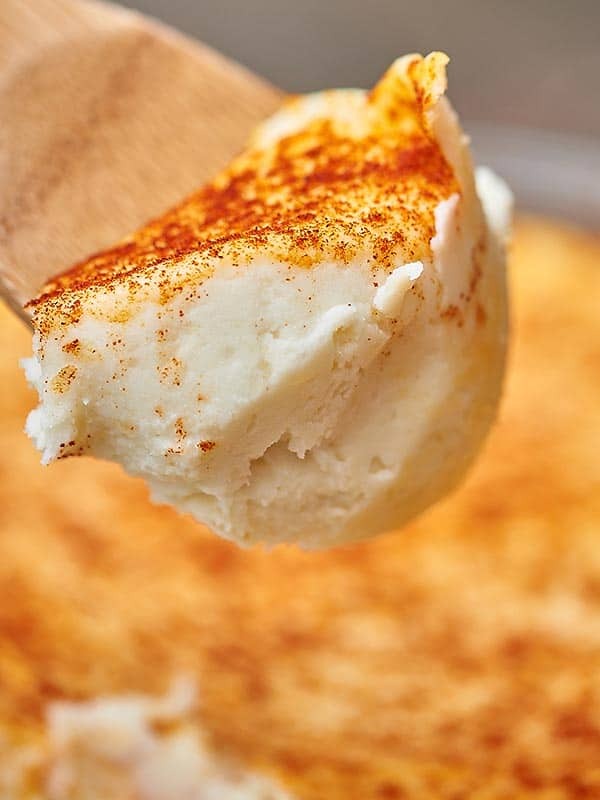 Gram’s creamy mashed potatoes are whipped until fluffy and are full of cream cheese, sour cream, and butter to make them even more decadent! 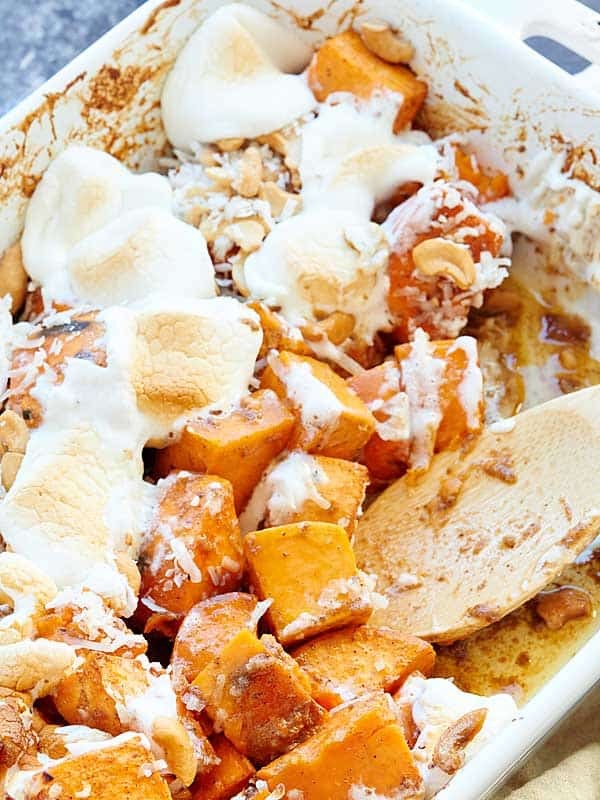 This sweet potato casserole is full of roasted sweet potatoes, cashews, coconut, and marshmallows and is smothered in a brown sugar, cinnamon, butter sauce! 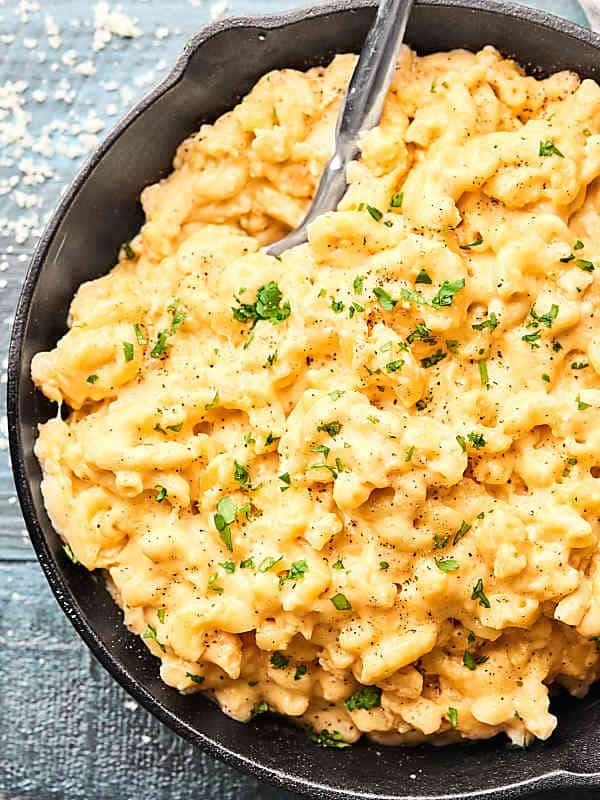 This Slow Cooker Mac and Cheese takes minutes to put together and is full of FOUR kinds of cheese: Asiago, Sharp Cheddar, Monterey Jack, and Gouda, which makes this the best holiday side dish! 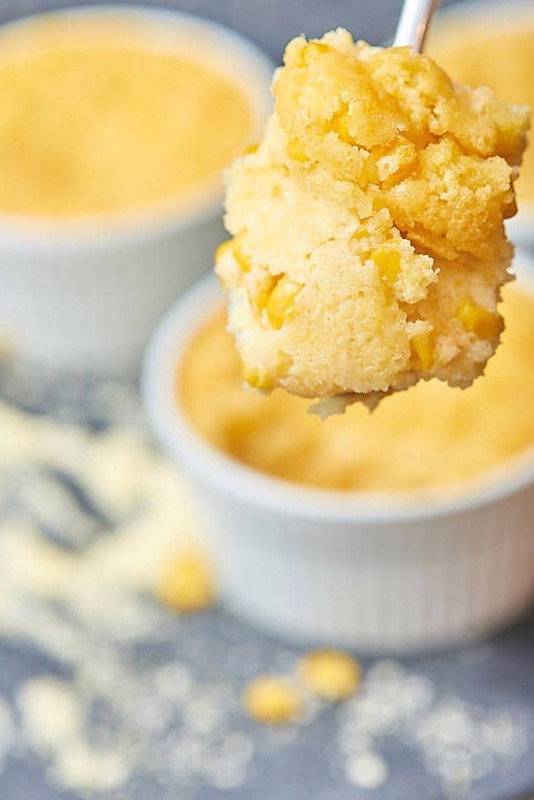 Only 7 ingredients and 5 minutes needed to make the BEST Creamy Corn Casserole. It’s fluffy, it’s creamy, and it will definitely be the star of all your holiday meals! A healthy-ish side dish that’s perfect for any occasion! 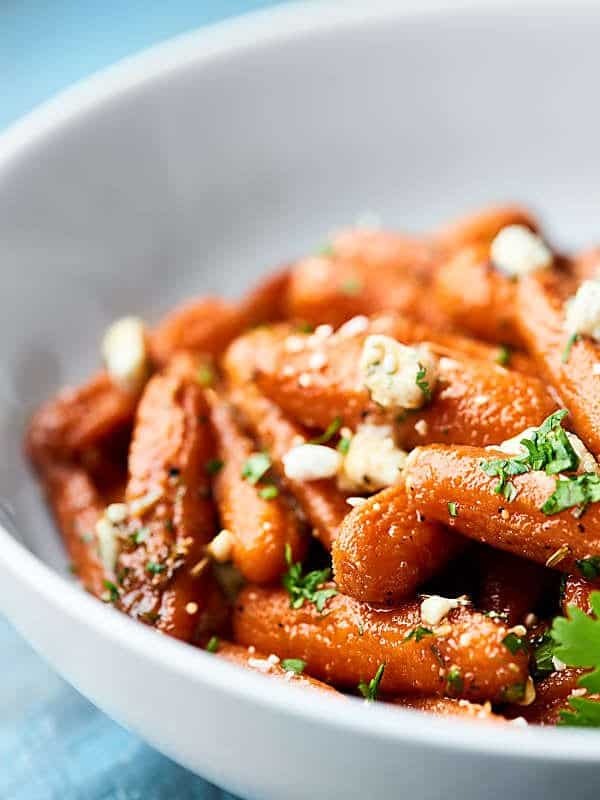 You’re only 10 ingredients and 30 minutes away from devouring these super simple and delicious Honey Roasted Carrots! 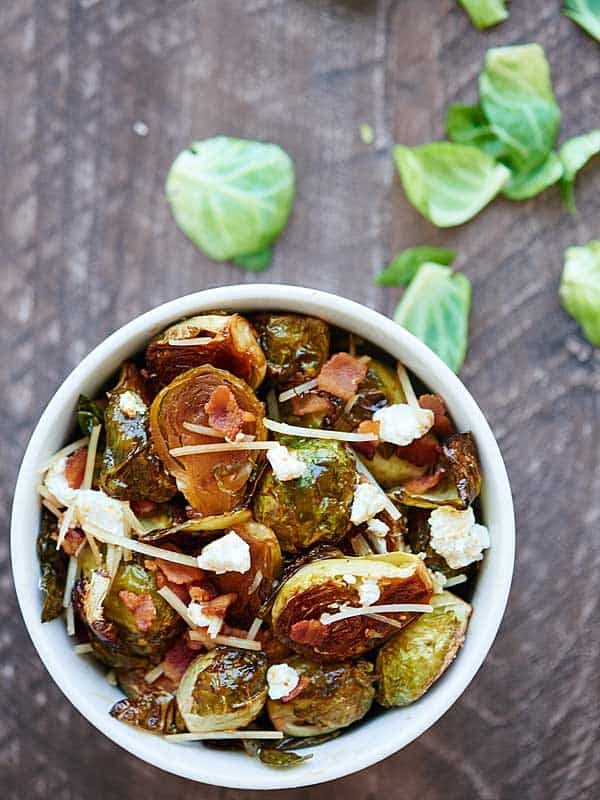 This Roasted Brussels Sprouts Recipe is smothered in a bacon fat, maple syrup, balsamic vinegar dressing and tossed with goat cheese, parmesan, and bacon! 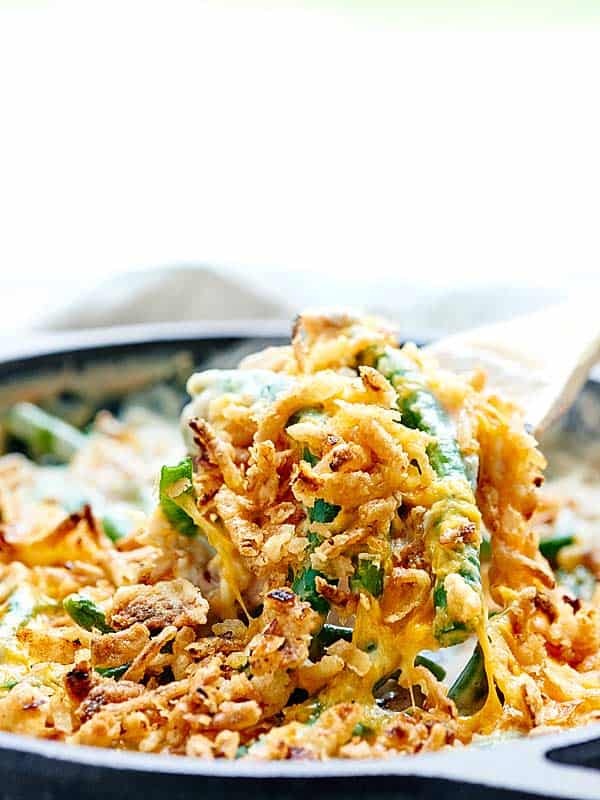 This is the BEST Green Bean Casserole Recipe. It’s creamy and full of bacon, mushrooms, cheddar cheese, and French-Fried Onion Rings! The perfect side dish. 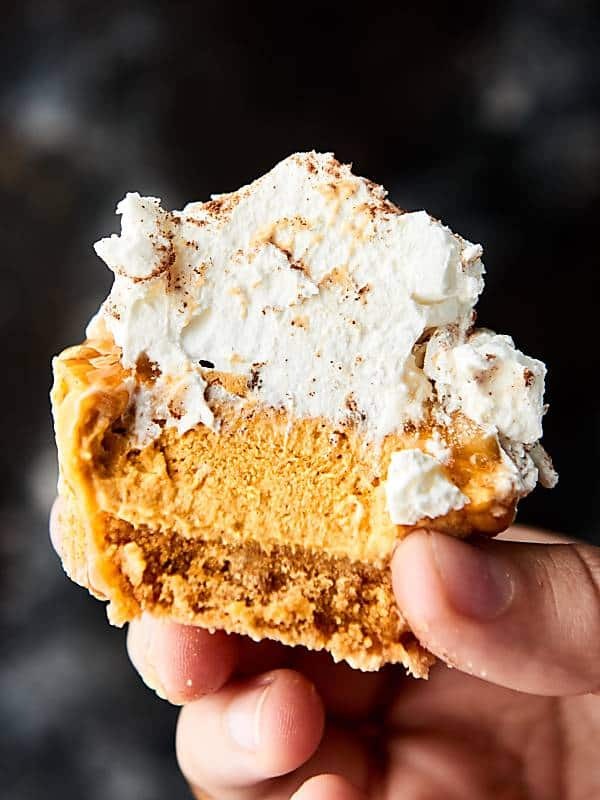 These No Bake Mini Pumpkin Cheesecakes are the perfect fall or holiday dessert! 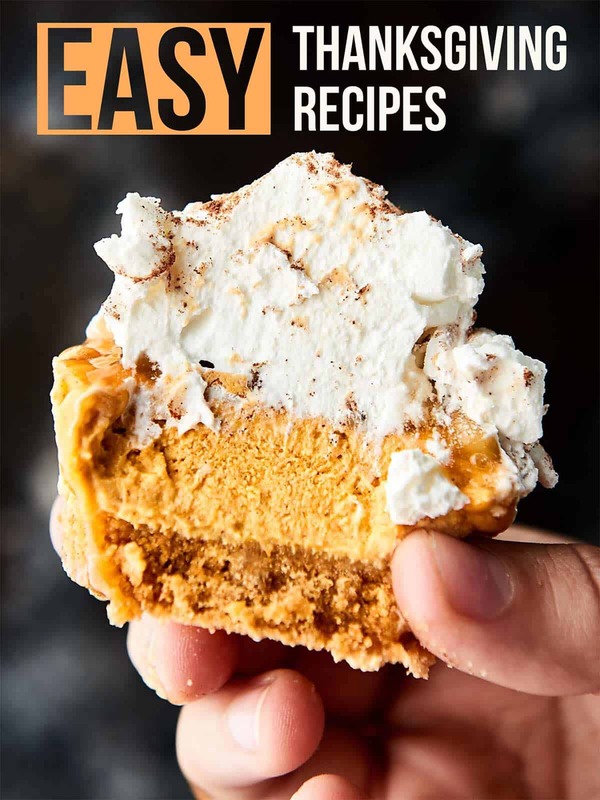 A simple graham cracker crust topped with a cream cheese, pumpkin, cool whip filling! Don’t forget the nuts and caramel drizzle! 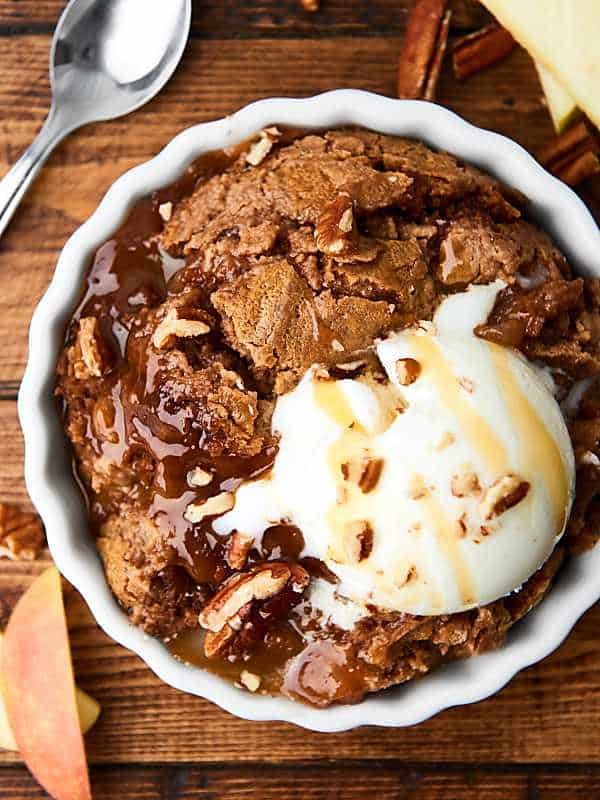 This Slow Cooker Caramel Apple Dump Cake Recipe might be my easiest recipe yet! Only 5 ingredients: apple pie filling, pecans, caramel, spice cake mix, and butter! 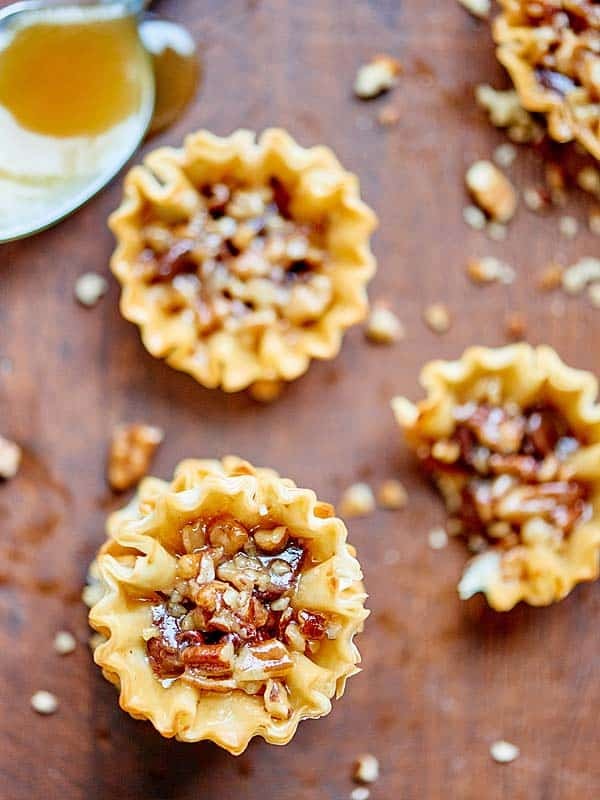 These pecan pie bites are cute, bite sized, quick & easy to make, & filled w/ a maple bourbon caramel. Chocolate chips are optional, but highly recommended! 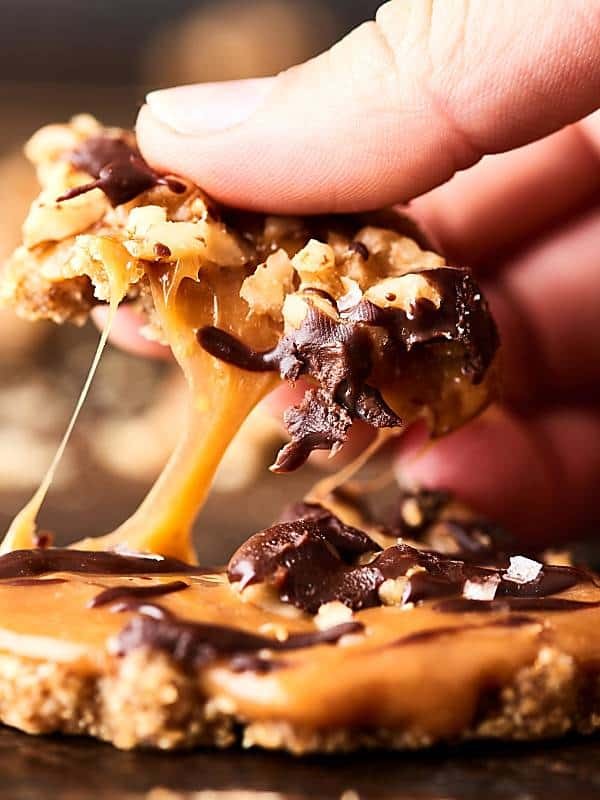 These No-Bake Easy Caramel Walnut Tarts are mind blowing delicious. Walnut, graham cracker crust topped with a two ingredient caramel, more walnuts, a two ingredient chocolate ganache and sea salt! 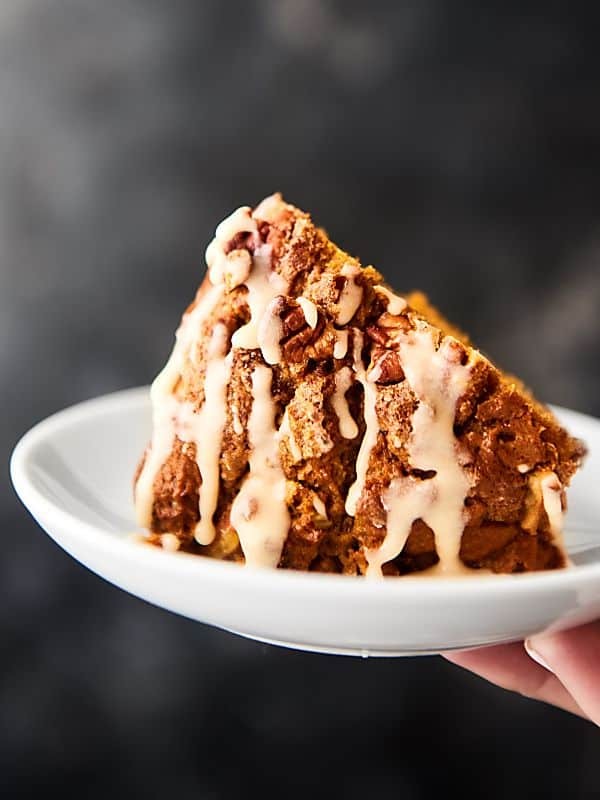 This Easy Pumpkin Coffee Cake is perfect for your fall breakfasts and brunches! Spice cake mix + pumpkin puree, cinnamon, pecans, and a maple icing! PSST: Want more? 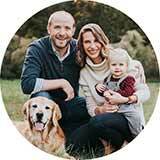 Click here for all Thanksgiving Recipes. What other Thanksgiving recipes would you like to see? Show Me the Yummy!